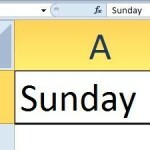 Each time you sense a routine, Excel normally has a way to automate it. Filling series are a great time saver and so simple to master. Consider the example of creating a monthly roster or calendar where we commonly use days of the week, dates or even months. We are going to use the fill series function to save us from a lot of typing. 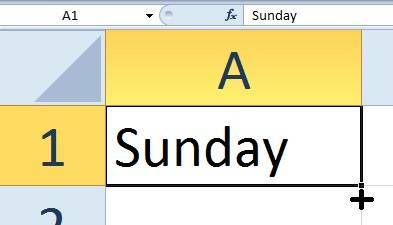 In Cell A1 type the Word Sunday and press enter to lock it in. You should have the days of the weeks filled in the cells which you dragged down until. Getting your pointer to change to the black cross (or as Microsoft calls it, the fill handle) can take a bit of finesse, if you’re finding it hard just increase the zoom (bottom right corner).